In Soviet Russia, cheezburger can haz you. Brilliant. I hadnt seen that yet. You know these are not really translations of the Russian, right? I didn't even really consider whether they were... what are they? 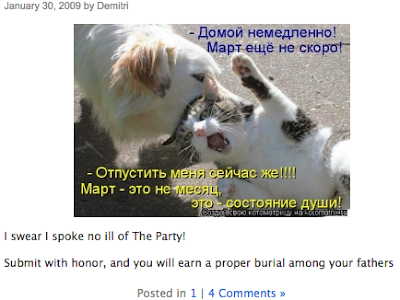 The images say something different in Russian - sometimes, but not always, less funny. Never political and rarely stereotypically Eastern bloc. The "translations" are new, completely made up captions in English. Someone often leaves the correct translation in the comments, but after looking a several, I would saw that they are sometimes a bit off. And some stuff is just hard to translate is such a way that it doesn't sound stilted. Even better than how Yakov's catch-phrase about life in the former USSR has survived, is how Yakov's personal theater in Branson, MO is really huge. Er, that's what I've heard. I've never been to Branson. Honest.